Imagine the best that Hornady has to offer -- a bullet manufacturer that has consistently innovated their industry’s technology since Harry S. Truman was in office, and now stands as one of the world’s foremost authorities on their craft. 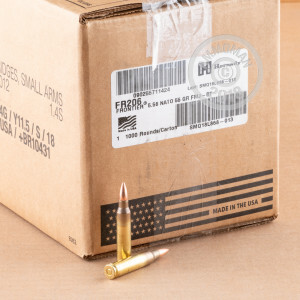 Now, imagine if they paired with the Lake City Army Ammunition Plant, a massive production facility which is able to crank out high quality military spec ammo at dizzying quantities, and cost-effectively to boot. You don’t have to imagine too hard if you invest in this excellent 5.56x45 cartridge from Hornady’s Frontier line of ammunition, a round which represents the very best of the two organizations’ new and exciting partnership. This is an M193 cartridge like they issue for field use with the United States Army’s M16A1 rifle. Its 55 grain projectile is made by Hornady, and accordingly possesses the uniformly dense core and concentric gilded metal jacket that are conducive to intensely satisfying accuracy. 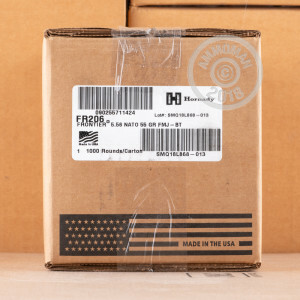 The rest of this round’s components are made by Lake City, and have each been meticulously inspected by Hornady both before and after assembly to guarantee you some of the absolute best performance that money could buy.